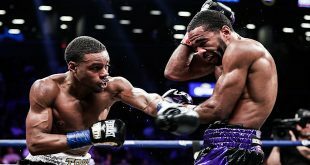 WBO Welterweight Champion Paul Williams stepped up to light middle and caged the vacant WBO belt by stopping former three time 154 pound world titlist Verno Phillips in the eighth round at Citizens Bank Arena in Ontario, CA in the highest profile bout in America this weekend. Williams overcame a bad cut from a headclash early on and used his massive height and reach advantage to good effect, keeping the much older Phillips at bay with hard shots to the body and head. It was the constant body shots which seemed to take their toll on the former champion as he began to slow down later in the bout but Phillips also didn't have the power to trouble his far taller opponent despite not having much difficulty in hitting Williams when he did throw punches. By the eighth round, Phillips was getting hurt and the bout was called to a halt before the ninth frame could begin to keep the 39 year old from further damage. Williams wins the WBO Light Middle title, improving to 36-1 (27), while Phillips drops to 42-11-1 (21) after a brave performance in what could be the last big fight of his long career. On the undercard, promising heavyweight slugger Chris Arreola, 26-0 (23), shook off a second round knockdown to turn the tables on opponent Travis Walker, 28-2-1 (22), canvassing the Texan twice later that frame before finishing the job in the third with a crashing left hook. 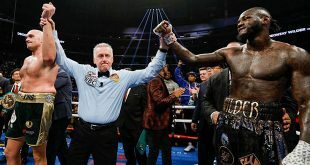 While Arreola continued to display impressive power, Walker showed that the Californian was very hittable, a condition that a more accomplished opponent could use to defeat Arreola unless the defensive deficiency is corrected. Welterweight Josesito Lopez, 23-3 (14), knocked out Alex Perez, 23-32-4 (18), in the second and heavyweight Manuel Quezada, 25-4 (15), outpointed Teke Oruh, 14-2-1 (6), after ten rounds. At Twin River Event Center in Lincoln, RI, heavyweight prospect Jason Estrada, 15-1 (3), won a UD against Derek Bryant, 20-5-1 (17), in an eight rounder and former featherweight Jason Pires, 21-3 (9), returned from a nearly six year layoff to outpoint Frank Houghtaling, 19-15-5 (4), in a hard fought contest at welterweight after six rounds. Former Olympian Demetrius Andrade, 2-0 (2), was in action, stopping Eric Marriott, 0-2 (0), in the final frame of a four rounder. There was also a bit of action on Friday as a parade of prospects and a former world title challenger were on display at the Doubletree Hotel in Ontario, CA. Featherweight Juan Carlos Burgos, 20-0 (14), stayed perfect with a difficult win via eight round majority decision against seasoned opponent Jesus Salvador Perez, 25-22-3 (14), and ex-welterweight world title challenger Antonio Diaz, 45-5-1 (29), won the third bout in a row in his comeback from a three year layoff by decisioning Mario Ramos, 17-5-1 (3), in an eight rounder. Flyweight Omar Salado, 20-1-2 (11), posted an eight round win against Jose Albuquerque, 8-5-2 (2), and super feather Dominic Salcido, 17-1 (9), stopped Celestino Rodriguez, 6-13-3 (6), in the fifth round of a scheduled six. Prospect Mauricio Herrera, 8-0 (3), upset Pavel Miranda, 16-3 (8), at welterweight with a dramatic eighth and final round TKO. 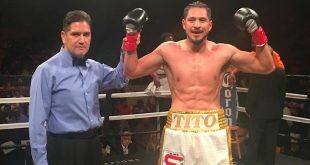 The Santa Ana Star Centre in Rio Rancho, NM saw welterweight contender Jesus Soto Karass, 22-3-3 (16), belt out durable Hicklet Lau, 20-18-2 (9), in the second while light middle Joaquin Zamora, 17-2-1 (11), took a ten round unanimous decision against puncher Jose Luis Gonzalez, 12-5-1 (10). At the Convention Center in Sioux Falls, SD, heavyweight knockout artist Joey Abell, 20-4 (19), was disqualified for hitting opponent Jason Nicholson, 18-25-2 (10), when Nicholson was on the canvas following a knockdown in the first round.